Cave-dwelling dwarfs, circus performers who worship an armless god, excrement that turns into gold… When you see a picture by revered filmmaker Alejandro Jodorowsky, you’re not likely to forget it. The man behind El Topo and Santa Sangre is also a comic book writer and tarot card expert, and launched a doomed attempt to make a 16-hour version of Dune in the 1970s. “Hollywood thinks I’m a crazy person!” he tells Matt McAllister. 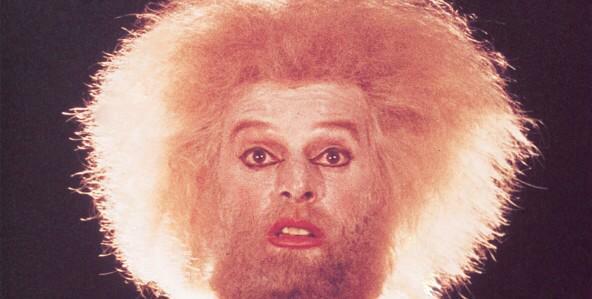 El Topo has just been re-released in cinemas. How do you feel about the film now? I feel like it’s Night of the Living Dead and I’ve come out of the grave! I have terrible memories of making it. Every day was a pain and every shot was difficult. I didn’t have the technique to do everything. In the morning, I needed to send guys with rods searching for snakes. This is what it was like with everything. I shot it against the unions, hiding like a criminal, because I didn’t have the money to pay them. I did it against the law. I am not Hitchcock. Hitchcock made his pictures before shooting them. He knew how the public should feel and manipulated their reaction. I didn’t want to do that. I wanted to make a film where everyone can react in a different way. Why are you so drawn to people at the margins of society? I like nothing that is normal and everything that is different. Normal is a pain in the balls. I am influenced by the paintings of Goya, Bosch, Rembrandt… For me a dwarf is not ugly. A monster is not ugly. It is just a different form of biology’s imagination. When I see a person, like you, in some ways you are normal person – but in other ways you are a young monster interviewing a big old monster like me. It’s not a normal situation. Would you say that you make ‘spiritual pictures’? You can be a political person, a sexual person, a mythical person, a religious person… You are a whole, a totality. For me a picture is like that. In some ways they are mythical pictures, because I speak about certain things. But I think commercial pictures are castrated from the soul. The industry doesn’t touch spiritual problems. All American pictures are propaganda. People like 300 because it is technically very well done, but it is about giving your life against Iran. It is poison. Art needs to have an ethic. Why is the king of the invaders a gay, black person? And why are the invaders these black monsters? What they did to the elephants was terrible. My elephants [in Santa Sangre and Tusk] are like goddesses. In 300 the elephants are idiots. Is it possible to make a personal movie in Hollywood? No, you need to go out of Hollywood to make art, because they just want to earn money. Now it is the kingdom of quantity and the idiots get what they want. You need to make films in another way, like a gift for a person. Don’t show the picture in the theatres, because when they show pictures there, it makes money or it does not make money. We need to show pictures on the internet and we need to do it for free. Where would the funding come from? From crazy persons, idiots, gangsters…anywhere! I have enough money to make a documentary. I could either buy a house or make a picture. If I buy a house it will be a house for my children when I die. If I make a picture I will lose everything. What do you think I will do? I will make the picture! I never wanted to give money to my children. My father never left money to me. I prefer to make a picture. And this picture will be shown free – on the internet, in the walls of the city, anywhere! We need films without stars. I will never have stars who know 100 percent what I need to do. I need to hypnotise them, convince them, fight them. The stars are the idiots of the art. In order to make my new film, King Shot, I needed stars, because without them, I don’t have the money. But I am very good friends with Marilyn Manson and Nick Nolte. They searched me out, they said they would play anything in my films. What can you tell us about King Shot? Imagine we are sitting together in this room, but it is in the middle of the desert. It’s drama, conflict, everything you have in a normal picture. But, outside, people are digging in the street, and they find the enormous bones of a giant! That is my picture! Who will give me money for that? When I show my screenplays to producers they make a sound like a fart! It is impossible. I need money and they just fart. Even though films like El Topo and Santa Sangre are so highly regarded? But they still think I am a crazy person! I never earned money from my pictures. I didn’t do films to become a millionaire. Producers try to cheat me and I hate them. I want to give a gift to the public, I don’t want to earn anything. When pictures are finished I am happy they are released. Now I just want the public to see my pictures in a good condition. It is not a business for me, I swear it. I am against the industry. Yes! I wanted to make a picture 16 hours long! It was crazy. But Lord of the Rings was 10 hours in three films. So for 16 hours I could make 16 pictures. My version would not be like a normal person’s. What did you think of David Lynch’s version? Terrible. But he doesn’t like it either. He knows it is a failure. But it is not his fault, it is the producer’s fault. He came inside the commercial system, and then they killed it because the artist cannot do everything. People read the scripts and say, “I want to change that, I want to change that.” In my pictures I need to do everything. How far did you get with Dune? We also had Dan O’Bannon, who made a lot of science fiction pictures afterwards. But he was in a mental clinic for two years after Dune, from the shock of wanting to make the picture. But I realised I could make comics and books instead, so I took my images and made The Incal and The Metabarons. I made a whole universe with that. Do you still maintain that Luc Besson stole a lot of ideas from The Incal when he made The Fifth Element? He did. And I am happy! I never wanted to go to trial with Luc Besson. Why can’t he have my drawings? I wanted to reach out to him and say thank you! When you do something you give it to the world. Otherwise, it is like a mother who is jealous when her son finds a wife. It must be good to see directors cite you as an influence. I am happy. I went to Korea some months ago and I met the director of Oldboy. I like South Korean pictures and I like Oldboy. I wanted to say I liked his picture, but he didn’t let me, because he was telling me how much I influenced him. What happened to the rumoured sequel to El Topo? If you give me $12 million I will make it tomorrow! I might do it with my sons. If I make King Shot with five million, I am sure I will make money, and then I will do it. If I don’t do that, I will make my documentary on psychomagic. But most of the industry will hate me! Because I will not let them put me in theatres, only on the walls of the cities! El Topo is currently on release at selected cinemas nationwide. The Holy Mountain, El Topo and a six-disc Jodorowosky DVD box set are released on 14 May.